Dry lightning is causing issues for firefighters out West. 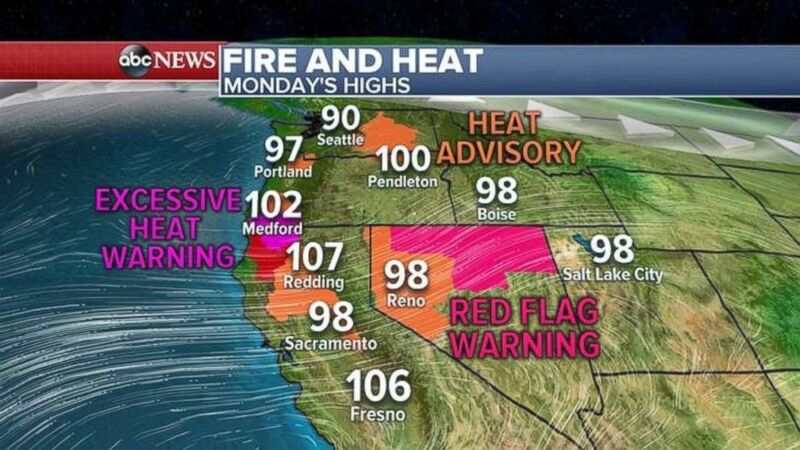 Hot weather moving into California and parts of western Rockies on Monday and the next several days -- with temperatures soaring into the 100s -- will has authorities fearing more fires could start. There are 35 large uncontained wildfires burning across the western U.S. on Monday morning. Temperatures soared yesterday to 100 degrees in Portland, Oregon, for the first time this year. The temperature was just a few degrees shy of a record. With the heat, dry weather, gusty winds and dry lightning, numerous fire and heat warnings have been issued for the West. (ABC) Numerous fire and heat warnings were issued throughout the West on Monday. Heat is shifting south into central California and parts of Nevada over the next few days. 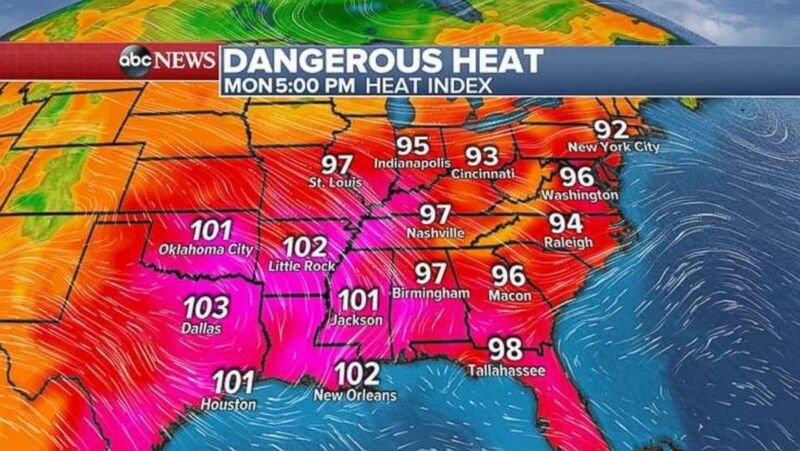 It's also very hot in the East and the South, with temperatures in the 90s, but with humidity making it feel like it's near or over 100 degrees from Texas to the nation’s capital. A heat advisory was issued for five states from Oklahoma to New York. (ABC ) Temperatures are forecast to come in as high 103 degrees in some parts of the country on Monday. Over the weekend, very heavy rain fell in a short period of time in parts of the Southwest and into the Midwest causing flash flooding. Just east of Las Vegas Saturday night almost half an inch of rain fell in just five minutes. Record rainfall of over 2 inches fell in part of Utah on Saturday. Flash flood watches continue Monday morning from New Mexico into Colorado for more locally heavy rain as monsoon season continues. 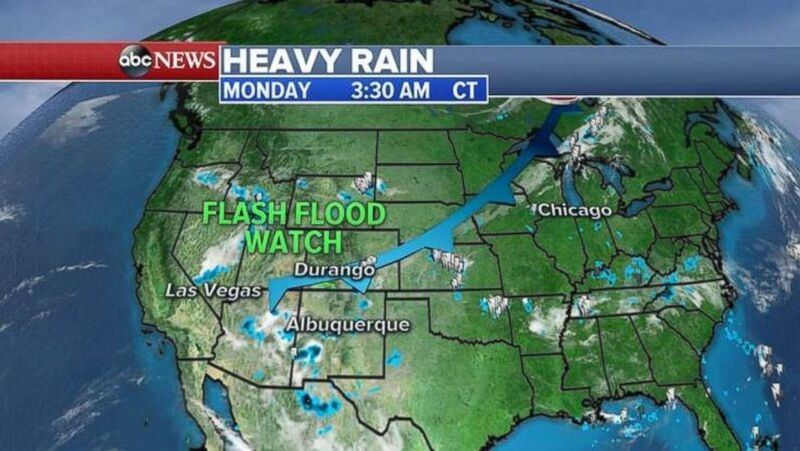 (ABC) At least three west coast states were under flash flood watches on Monday. A cold front stretches from the Great Lakes into the Southwest on Monday morning adding to the lift in the atmosphere -- and creating more storms with heavy rainfall. The cold front will eventually move east and bring storms and very heavy rain to the East Coast from Boston to Washington, D.C. on Tuesday. 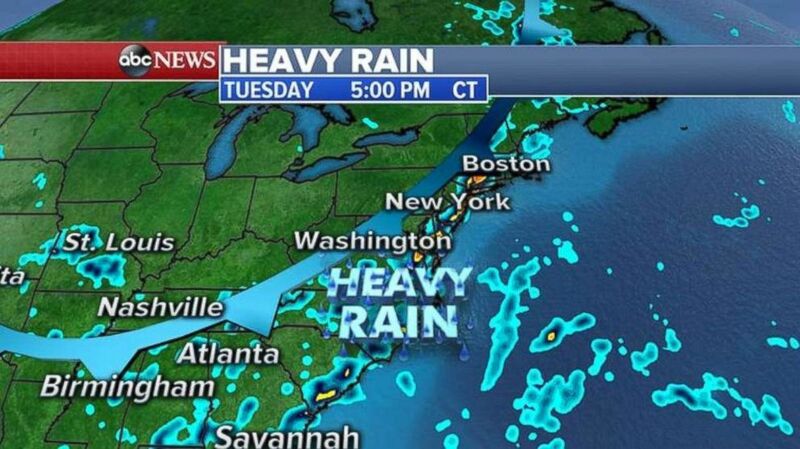 Flash flooding, lightning and gusty winds are possible for the East Coast. (ABC) Flash Flood Watches are in place in areas between New Mexico and Colorado as monsoon season continues there.